Iman Lathan pushes the ball downcourt. 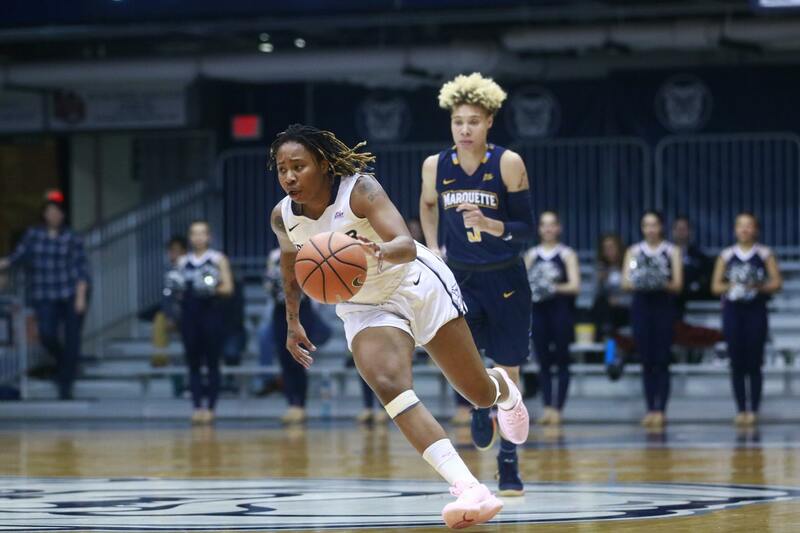 With the win over Providence, the Butler women’s basketball team advances to face Marquette in the Big East quarterfinals. Jimmy Lafakis/Collegian file photo. The Butler University women’s basketball team came from behind to defeat Providence College 73-67 in overtime in the first round of the Big East Tournament in Chicago, Illinois on March 3. The Bulldogs have now won their first round matchup in the tournament each of the last three seasons and have reached the quarterfinals for the fifth consecutive year. After a slow start to the game, Butler was able to get things going midway through the first quarter, but trailed Providence by two points at the end of the frame. The Friars held the lead for the entire second quarter, growing as much as an eight-point lead before Butler closed that gap to 34-30 heading into halftime. Providence shot 64 percent from the field in the first half while limiting Butler to just 36 percent. Sophomore guard Kristen Spolyar tallied 11 first-half points for the Bulldogs, while redshirt junior guard Whitney Jennings and junior center Tori Schickel, the team’s leading scorers, were limited to 11 combined points. The Friars once again expanded their lead to eight points midway through the third quarter. Butler was able to prevent Providence from pulling away, but still trailed by five points heading into the final ten minutes of regulation. But with the end of their season potentially just ten minutes away, the Bulldogs went on an 11-0 scoring run to begin the fourth quarter, taking the lead with just minutes to play. Providence tied the game at 62 with roughly 20 seconds remaining, but a last-second jumper by Spolyar fell short to force overtime. The Friars took the lead early in the five-minute period, but Butler responded with a layup by junior guard Michelle Weaver and two made free throws by Schickel. A 3-pointer from Spolyar roughly 30 seconds remaining helped push the Bulldogs’ lead to seven and secure a Butler victory. Spolyar led the team with a game-high 21 points, converting four 3-pointers and also picking up five rebounds. Despite their slow starts, Jennings finished with 20 points and six assists, while Schickel tallied 17 points and 11 rebounds for her 11th double-double of the season. Weaver finished with seven points, while senior guard Sydney Buck converted two 3-pointers for six points. For the game, Providence outshot Butler from the field 45 to 38 percent and from beyond the arc 44 to 38 percent. Butler out-rebounded Providence 36-31. With the victory, the Bulldogs advanced to face first-seeded Marquette University in the quarterfinals of the Big East Tournament on Sunday, March 4 at 1 pm. The game will be broadcast on FS2. Butler fell to Marquette in each of their two matchups this season, but nearly completed a comeback on the road against the Golden Eagles on Jan. 13 before losing at the buzzer.